The Corresponding Secretary recently received a laconic message – a note scrawled on the back of a band flyer, but more oddly still, neatly folded and stamped in an envelope. The note states that it would behoove the editors of Communiqués to have read a short story titled “The Beak Doctor,” written by Eric Basso in 1977. Beyond a polite intro and outro, this is all it contains. We have read the story, and have a few comments to make. 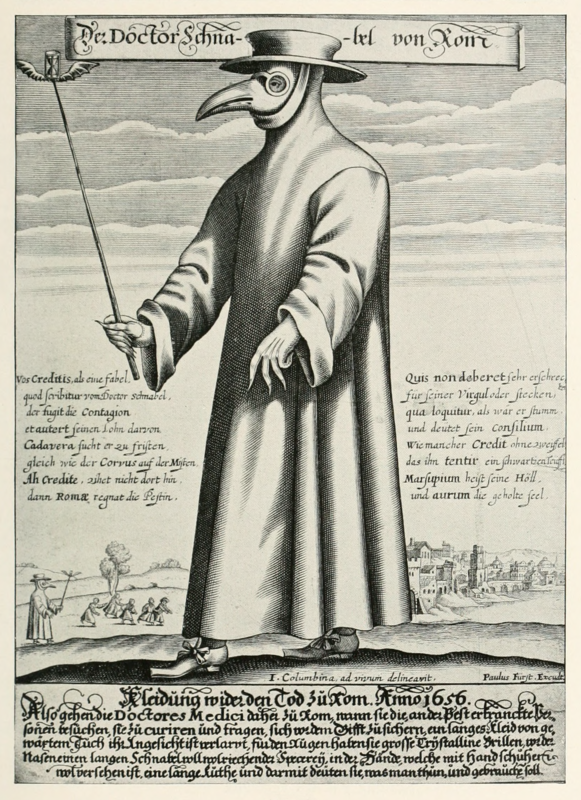 “Attributing the disease to corrupt vapours, the physicians protected themselves by means of suits of leather, with large crystal glasses and a long snout containing aromatic spices, employing also a wand with which to issue instructions” (“The Plague Doctor,” Journal of the History of Medicine and Allied Sciences, Vol. 20 Issue 3). 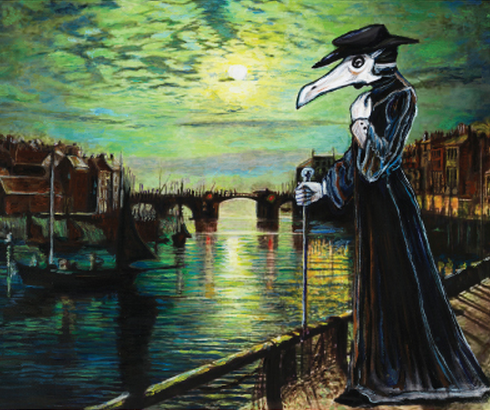 The foul vapors or “miasma” believed to be responsible for spreading the plague filled the role later held by germs in the medical and hypochondriacal imagination. The beak in the beak doctor’s costume acted as an air filter, being stuffed with substances and materials understood to prevent the plague-particle-bearing miasma from reaching the nostrils, by overpowering it with stronger aromas: lavender, sage, rosemary, mint, camphor, dried flowers, garlic. The beak doctor was avoided like the plague, as it were, by the healthy, and was expected to live cut off from ordinary society. 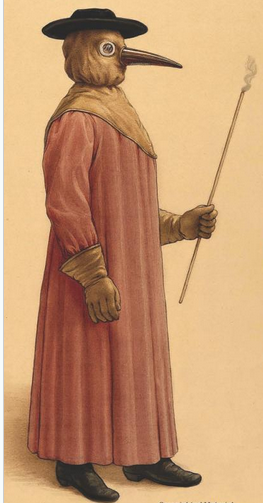 Those commissioned as beak doctors were also frequently empirics – which is to say, lay practitioners who believed in the virtues of observation and experience in medical practices, rather than in studium. Now, aside from the fact that members of the Order of the Third Bird, by a short stretch of the imagination, could themselves be called empirics, lay-midwives of experience; and aside from the fact that they frequently engage in the self-isolations of ritual; or to take it further, that the protocols of the Order could be considered prophylactic in one or more ways – what exactly did our correspondent have in mind with his literary recommendation? The beak doctor, in Basso’s story, carries a penlight, prescription pad and vials of penicillin instead of a staff, but the accoutrements of modern medicine are as useless to him as bloodletting would be. Moreover, his mask doubles the effects of the fog and the disarticulated language. Through the small eyeholes, everything he sees is isolated and framed; everything becomes an image without ground or context. It is possible that our correspondent wished to indicate to us what Bird-like acts of attention might look like in a Gothic mode, which is to say as a series of acts of adaptation and survival in a world rendered labyrinthine, fragmentary, uncanny and miasmatic – or perhaps a series of acts that render the world labyrinthine and mysterious, vignettes pearled out along a tenuous thread, each an enframing that makes what is seen and sees what is made. Before the turn of the new year, we at Communiqués came into possession of some material, concerning the Order of the Third Bird, that at first appears to be part of a book by a valued associate of the Order. We are told that the Birds of the Order did not for a minute believe that the author, Yves Citton, was responsible for this material, which as it turns out was inserted into the book manuscript by an unknown malice-maker in the final stages of publication. It would be difficult, in any case, to understand how a Bird could have written the pages reproduced in part here. Citton himself, of course, has been speaking of aesthetic experimentation as a kind of athanor of social values – or as a prayer-like suspension of everyday praxis that ultimately allows new forms of praxis to take shape. The contrast between this setting and the alien pages concerning the “Troisième Oiseau” (Third Bird) is substantial for those who – like the Birds themselves – know how to look. If the act of looking, in these pages, is what transforms the fundamentally formless into an image, the objects of attention are literally created by acts of attention, as if one were constantly Photoshopping a sea of shifting pixels. In other words, to lend one’s attention to a painting has the effect of arbitrarily consolidating and confirming this painting as a discrete and single object. The practice of the Order begins to look like a conservative act, one of maintaining and reinforcing familiar partitions of the given (the division of reality into things like paintings and sculptures), and a kind of willful forgetting of fundamental instabilities. One almost begins to imagine acts of Birdlike attention partaking of something like the righteousness of the 36 hidden saints, or tzadikim nistarim, who humbly and silently keep the very world standing on its pillars. All this, of course, is absurd – and we are glad that M. Citton has clarified the matter for us. 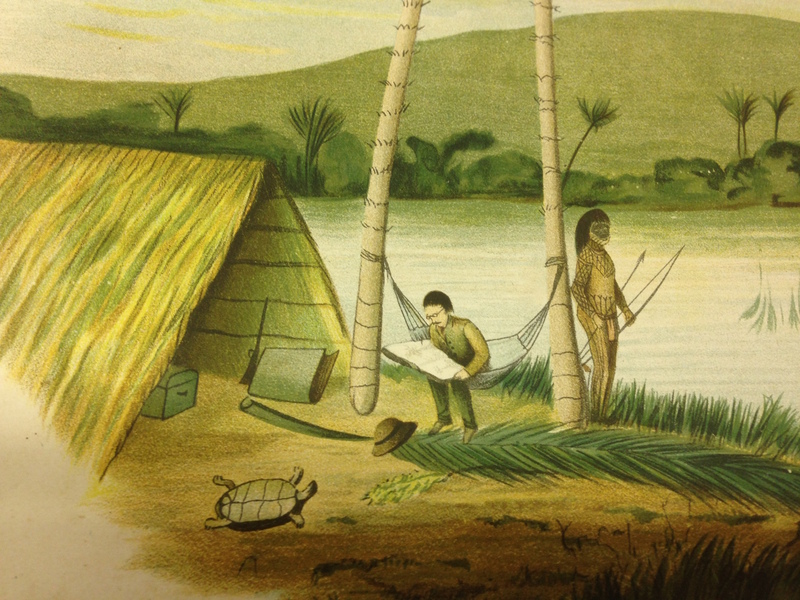 We submit an additional thought: It is not only the turtle that feels oddly placed and that seems to call attention to itself – insofar as an object might be said to “call” an action, as much as do those who attend upon it, and insofar as an echo of this “call” might persist in a subsequent image. The hat – presumably belonging to the man who is reading – feels almost to have fallen onto the image from above, like a crumb, eyelash, or paper cutout; the same for the palm leaf petiole that seems about to transfix the hat, and for the large folio swaying at the petiole’s tip like a new leaf. The uncanny juxtaposition of the hat, petiole, and folio parallels the mysteries of the action itself. “What is the purpose of the Order? Our correspondent passes on to us a passage from an obscure but extraordinary treatise on aesthetics by the great Moldavian poet-philosopher Benjamin Fondane: False Treatise of Aesthetics: an Essay on the Crisis of Reality, written in 1938. Since the book does not yet exist in English, we quote the passage below in abridged translation. Beyond the Delphic closing comments of our correspondent (who feels, to summarize, that “realizing” a relation is a matter of accession to a reality that is “other than relation”), we have some additional comments of our own. In available action-transcripts by volées in late interwar Europe, when Fondane was writing, one often finds the word “poetic” used in a very broad sense that encompasses the more specific tasks and attitudes of the Order. Influenced by prevailing philosophical-aesthetic trends, persons associated with the Order at that time unhesitatingly substituted, for words like “practice,” “action,” and “attention,” precisely the phrase “poetic experience.” If one no longer does so today, this does not mean, of course, that the Birds of the past have nothing to say to us. It should also be added that Fondane’s words bear some relevance to the question of why the Order tends to use works of art in its practices. What becomes of the “work of art” in his account? Further reflection on this question is invited. A London-based book collector recently sent to the secretary of ESTAR(SER) several images from an unusual volume that came onto the market last year. The specific exemplar has since been sold, but the images themselves tell a great deal. Follow up work has enabled me to consult another copy of the same volume, and that preliminary research informs this contribution to the ongoing series of “Notes and Queries” posted here in the Communiqués. 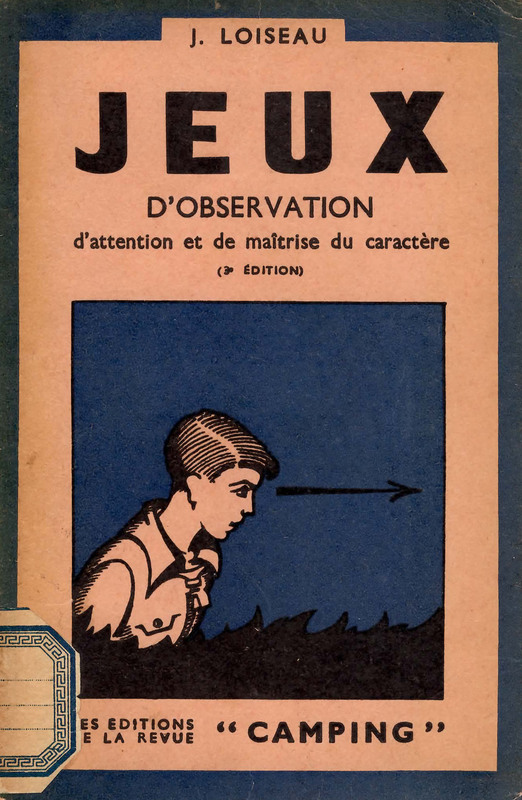 The image below depicts the (soft) cover of JEUX D’OBSERVATION, published as the first volume in a series of pamphlets issued under the editorial imprint of the Revue “Camping.” This third edition would seem to have have been printed in 1942, in Paris. Of the author, one “J. Loiseau,” relatively little is known. Jean Loiseau (1896-1982) appears to have been an archivist at the Bank of France, and a committed devotee of scouting clubs (in which he was known as “Renard,” or “the Fox”). His (apparently) given name, which means, of course, “The Bird,” hints at his other preoccupations, which will be our concern here. 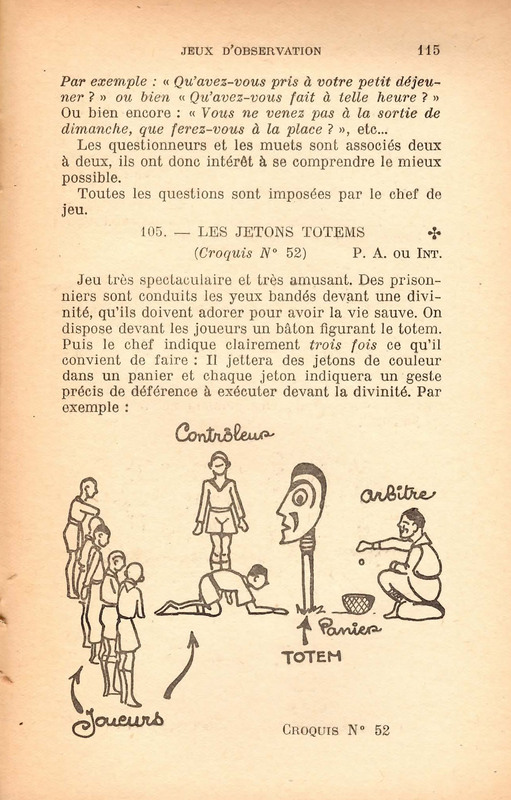 The booklet — which consists of 160 pages, many illustrated — is an extraordinary compendium of attentional exercises and collective practices of attention, presented as a sequence of games to be played by young men and women (primarily, it should be said, by scout-aged men). 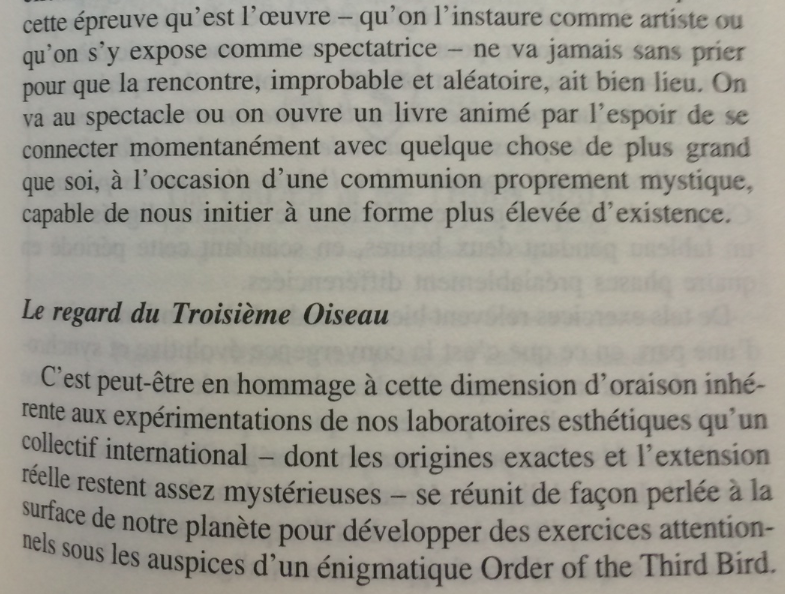 Loiseau promises that these collective practices will teach “how to look,” “how to observe,” “how to discern,” and, finally, how to “pay attention” in ways that conduce to the “maîtrise du caractère” — the mastery of character/selfhood. Significant divergences from orthodox usages of the Order will not be overlooked (the flat social architecture of the modern Practice has no equivalent to a “controleur” or “arbitre“; the physical posture of the crawling supplicant — while not unknown in the annals of Bird habitus — is, nevertheless, extremely rare; the general gamesome theatricality of the “Jetons Totems” is at odds with the putative seriousness of the Order’s occasions), but it is difficult to avoid the suspicion that J. Loiseau has here encoded, as elsewhere in his volume, instructions to adepts and/or initiates in the Order. Which reveals a tell-tale book-stamp, clearly marking the volume as part of one of the “Attentional Libraries” commonly associated with a volée of the Order. Closer work with this remarkable text is clearly desirable, and it would be a great boon to the work of ESTAR(SER) if the purchaser of the copy in question were to come forward and offer it for further examination. It is possible that the volume, which appears to have crossed the Channel sometime after the Second World War, contains marginalia or other paratextual material that would be of enormous value in our ongoing work. 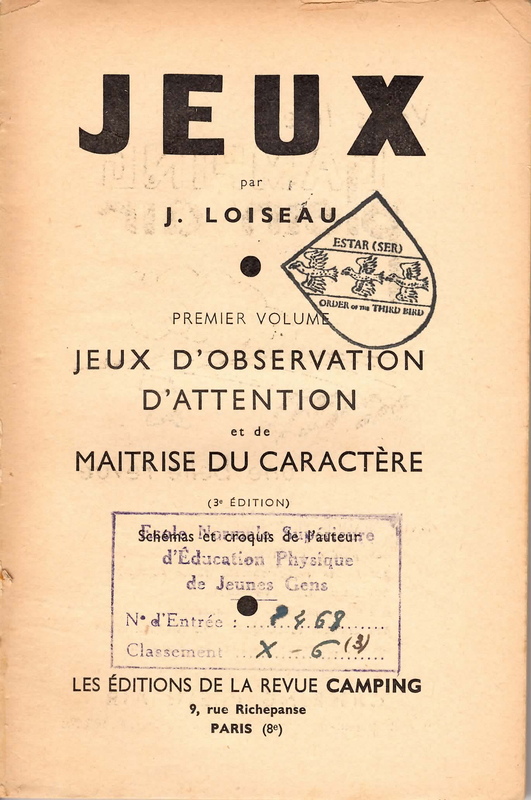 Till then, we are left with strong evidence that “Loiseau” was the nom de plume of a notable Bird in midcentury France, and that his popular works were designed to be read as romans à clef by associates of the Order. A member of the IFRAO (International Federation of Rock Art Organizations) and associate of the Order from Lublin, Indiana who would like to remain anonymous has sent to Communiqués a comment on an item among the “familiar queries” regarding the Order with which many of our readers will be familiar. “What is the origin of the Order? Our correspondent’s message concerns an ancient object which our readers will recognize from their college art historical surveys. We reproduce the message here in full and without commentary, agreement, or disagreement. 3 million years ago, the earth had just entered the Placenzian Age of the Pliocene, and Australopithecus africanus walked the earth. It was the age of the giant Arctic camel, and of the largest ever flying bird: Argentavis magnificens. In a cave in the present-day Makapan Valley in South Africa, an A. africanus community left a small lump of reddish-brown jasperite, later retrieved by 20th-century archaeologists. This bit of stone has two deep, close-set eyes under a flat brow, broad cheekbones that sweep up to a round microcephalic skull with a ridge marking a hairline. Below a nose-like indentation, there is an open, meditative mouth with gently curved lips. Did A. africanus somehow work this stone to make a crude face, so so long ago? Hardly, we are told. They could not have made tools capable of it. Microsopic examinations indicate that natural, nonhuman (or non-humanoid) processes were responsible for the stone’s appearance. What apparently happened was that, struck by the resemblance of this stone to himself – or rather, to those like himself – some Australopithecus picked it up from a stream bed and carried it back to the home cave, over tens of miles. What did he and his cavemates do with it when it arrived? Whatever they did, would it have met the definitional requirements of a “formal community,” however isolated in space and time from other such communities? The utter mystery of what a manlike animal and a manlike object would have had to communicate to each other partakes of the darkness of the Order’s origin. It becomes clear to me that a Birdlike relation to an object – before such a category as the made artwork existed – would have encompassed and enfolded all our ulterior categories, like making and finding, like encountering and inventing, like art and non-art, like things made to be looked at, and things that, being looked at, are made. It is not that this encounter with nature awoke a slumbering sense of “aesthetic appreciation” in this apelike man. It is not that the category of aesthesis was discovered in this moment. It is that aesthesis was already in the world, ape and stone being of course part of this world. Nietzschean Tactic for the Negation Phase? 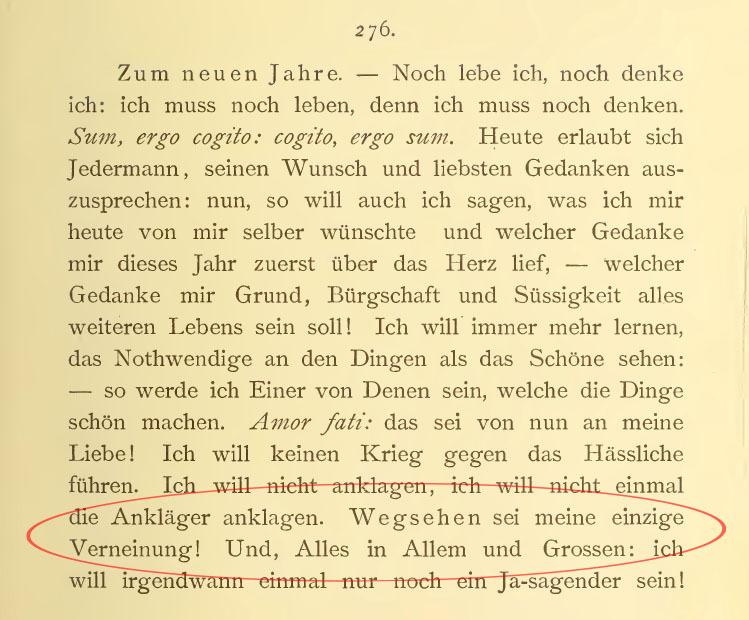 I thought many of you would appreciate this moment at the beginning of Book Four, where Nietzsche as much as blurts out, in one of his ecstatic trumps, his commitment to a kind of “affirmative” negation, achieved through simple aversion of the gaze — a kind of negation-by-obliquity. The beautiful cry — “Let looking away be my only Negation!” — summarizes what, I think, many members of the Order have felt as they attempt to pry themselves from their attentional cathection to the object at the end of the Attending phase. Not that I would know. I am just guessing, of course. 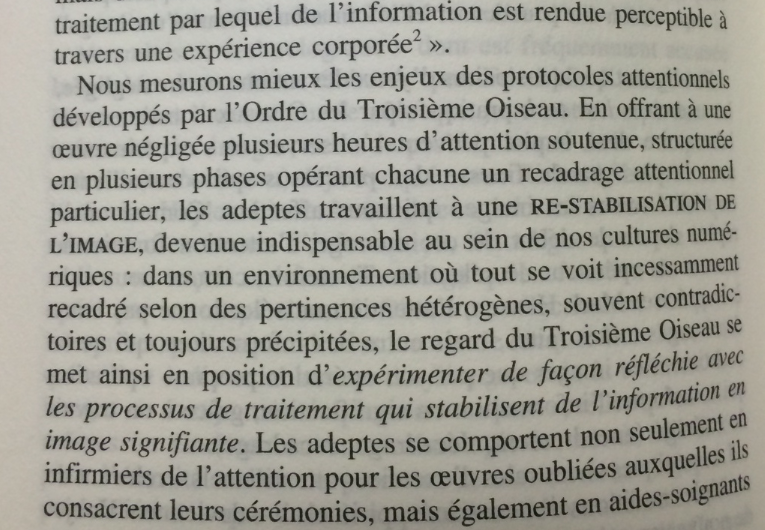 Pour ma part, d’ailleurs, si l’on veut réduire l’instinct esthétique à une tendance de métamorphose en objet ou en espace, je ne m’y oppose pas. One admires Caillois’s decision to write “tendance de métamorphose” rather than a mere “désir de métamorphose.” The absence of a qualifying “temporaire,” however, is troubling. Certain of our readers perhaps have friends or acquaintances who suffer from a passion for contemporary kung fu films. In mid-eighteenth-century Japan, the Order in that region possessed a fairly competent military wing, for the stated purpose of self-defense. The letter author indicates the presence, in that context, of a chōjimujikan (鳥寺務次官)– coining a hybrid term in which the characters ordinarily used to denote an under- or vice-secretary in a modern bureaucracy are replaced by the homophonic characters denoting a Buddhist temple administrator (the import of the first character, of course, will not escape our readers). It was this “bird temple secretary,” to attempt a translation, who proposed that a certain cell of the Order in the Kantō area carry out an action on a battlefield, while a battle was taking place. It is unclear whether the object of the action was a concrete thing, like armor or ensigns, or more abstract, like the patterns and vividry of the battle itself. The “secretary,” it seems, doubled as commander of the armed defenders of the group, who stood in a vacuole of relative calm as the warriors circling them fought off stray attackers. It also seems to be the case that the warriors themselves participated in the action, performing a quick and streamlined version of its standard sequence during each personal skirmish, which they believed enhanced their skill in battle.